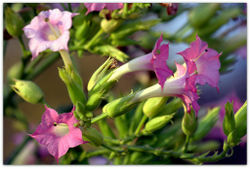 When tobacco is grown in the ground it is very sensitive to its surrounding environment. The type of soil, the humidity, are all very important factors to keep in mind when growing tobacco. The most optimal temperature when growing tobacco should be around twenty to thirty degrees Celsius; it also matters greatly when growing tobacco. The atmospheric humidity should always stay at around eighty to eighty-five percent. The amount of nitrogen is also an important factor to take into account when cultivating tobacco. Nitrogen levels need to stay at plentiful amount for optimal growing conditions for the tobacco plant. ↑ Classification USDA. Web. Accessed on June 2, 2013. ↑ Nicotiana Wikispecies. Web. Accessed on June 2, 2013. ↑ 3.0 3.1 Nicotiana GeoChemBio. Web. Accessed on June 2, 2013. Unknown Author. 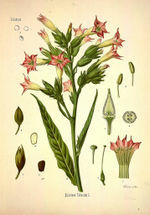 ↑ Nicotiana tabacum Wikipedia. Web. Accessed on June 2, 2013. ↑ Tobacco Wikipedia. Web. Accessed on June 2, 2013. ↑ Smoking & Tobacco Use CDC. Web. Accessed on June 2, 2013. This page was last modified on 7 June 2013, at 08:33.